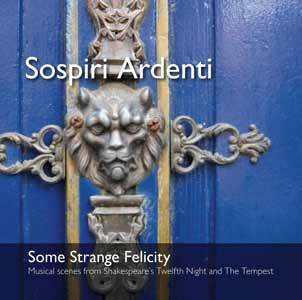 The ensemble Sospiri Ardenti specializes in the music of the late renaissance and early baroque -- a period of turbulent discussion over the directions which music should take, and of a passionate interest in the way in which musical texts could and should be emphasized in music and in performance. The name Sospiri Ardenti (passionate sighs) is taken from a song title out of Giullio Caccini‘s 1602 treatise, „Le Nuove Musiche.“ The humanistic renaissance search for the importance of the text and the early baroque passion for declaiming this text in an intelligible way were inspiring factors for the forming of the ensemble. The members of Sospiri Ardenti have specialized themselves in historical performance practices, and have performed with such renowned ensembles as the Flanders Recorder Quartet, American Bach Soloists, Artek, Philharmonia Baroque Orchestra, Mark Morris Dance Group and others. The ensemble has performed in Europe and in America.